"The Ultimate Driving Experience" Drive Indy Car - the unique opportunity to drive a modern-day Indy Car on a banked Oval Speedway circuit. Experience the thrill of driving a genuine 650 BHP V8 Indy car, with unrestricted power around the Las Vegas Motor Speedway Circuit, Nevada, USA. Experience the World's Fastest driving experience, when you drive a full size Indy Car like ones driven by Dario Franchitti and Mario Andretti. The Drive Indy Car Experience is the ultimate birthday or special event gift for any Motorsport fan. Or an Adrenaline alternative for Group Hospitality. Price: from £1,990.00 GBP p.p. 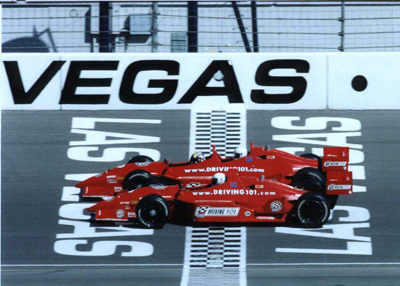 An incredible event claimed to be the World's Fastest driving experience, Drive Indy Car Las Vegas is an adrenaline experience with a difference. With fast-paced action throughout, you will have the many and varied attractions of Las Vegas to enjoy in addition to the spectacular on-track arranged for you. The VIP treatment begins the moment you arrive at your luxury hotel (a short taxi drive from the airport) on the famous Las Vegas Strip with all the attractions of this famous piece of real estate on your doorstep. Complete with casino, pool, restaurants and bars the hotel is a perfect choice and perfectly located. But let's not forget we are here to do some serious driving. Selected dates are available throughout the year ENQUIRE about Availability for your Drive Indy Car Las Vegas. Your visit to the Las Vegas Motor Speedway is guaranteed to be an experience you will never forget. Arriving by chauffeured car, the sheer scale of the place shocks and puts most European venues to shame. It boasts not one but two road circuits, a dirt track, kart circuit and motocross facility as well as the main 1.5 mile oval speedway. Today you focus on the oval as you take on the challenge of the Indy Car Experience. Oval racing is a unique discipline and not for the faint of heart. The speeds achieved are extraordinary (putting F1 to shame) and the racing takes place just inches from the perimeter wall. The purpose built Indy cars we have laid on pack a rumbling 650 bhp V8 and will quite easily achieve 200 mph. With the briefing over and safety kit on, fire-up the engine and, even within this vast complex, the sound is simply fantastic! Master the correct line and you will quickly be able to build your speed. 150 mph should be seen as a reasonable target; really get it right and you could become a member of the 170 Club. And with massive downforce, super sticky slicks and 20 degree banking you can expect some fairly serious g in the corners. With almost half an hour on track time (the lap record here is under 30 seconds) you will get in plenty of laps. There is no lead car to follow and every lap is timed so you will know just what you did. At the end you will also be booked on a scintillating ride in a 2-seater Indy car with a professional driver at the wheel. The perfect way to get the juices flowing for a night on the town in Vegas. © 2000 - 2015 Website designed by Web2move - Complete web design solutions.